We are so grateful for all of the support that we receive from our local community and want to say a big thankyou! So this page is dedicated to everyone who makes a donation to Careline – no matter how big or small, every penny really does help to keep our service running. A big thank you to the Freemason’s (St Oswald’s Lodge) for their very generous donation of £500 – what a lovely a thing to receive in the post on a Monday morning! We’re so pleased and very grateful. Many thanks to Marston Montgomery village charity for their donation of £100 – it’s much appreciated! 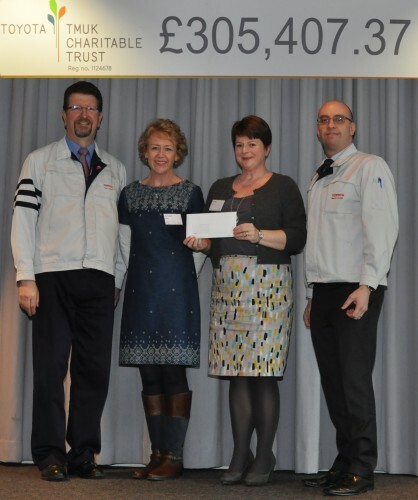 We were fortunate to be awarded £2,277 from the Toyota Manufacturing UK Charitable Trust last week – we’re so grateful to them for their support. We thoroughly enjoyed the ceremony and it was a privilege to stand alongside so many other worthwhile local charities.